On the weekend, I went to the National Japanese Canadian Museum to see a double feature: the film, The Cats of Mirikitani, and a display of the paintings featured in the film. This movie is about an elderly man, Jimmy Mirikitani, living on the streets of New York who makes his meager living as an artist. 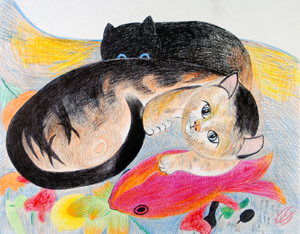 He does different colour drawings, many of them about cats. A film maker living in the neighbourhood meets him and befriends him and begins filming his artmaking. Then a few months after they first meet, the Twin Towers are attacked, and a hazardous smoke fills the neighbourhood. Out of concern, the filmmaker, Linda Hattendorf, invites Jimmy to take shelter in her apartment. The film then traces the growing friendship between the two and unravels the life that brought Jimmy to the street. Hattendorf makes several interesting points with her film. The main point seems to be about the rich histories of those we may walk right past on the street, and how their lives can be rehabilitated. In addition, she makes the important connection between the prejudice following September 11th, and the racism of the internment camps, just as Jimmy sketches the parallels between both the bombing of Hiroshima and the burning of the Twin Towers. The show of paintings was organized around the film, and seems to show many of the paintings he created on camera. The work is bright and energetic and encompasses everything from political landscapes to cats. What is really interesting is how Jimmy Mirikitani worked on any materials he had handy: cardboard, thin paper, collaged scraps. Everything feeds into his art. But what struck me most was the spirit that helped Jimmy live through all his hardships was the belief that he was an artist, a great artist and that was his path. He refused to join the Japanese navy, he tried to get a reprieve from the internment camps, he made a living on the street, all because he was an artist. The creativity and the creation of art seemed to keep him alive both in body and spirit through many trials. Many artists today look for confirmation through sales, gallery representations, show reviews and peer admiration. Clearly, being an artist is what we can decide ourselves. I am an artist because I make art. The continuous making of art is what distinguishes the true artistic souls. The show continues all during March and you can see the film as well on Saturday, March 26th at 2pm. If you’re not in Vancouver, I would urge you to see the DVD, it’s both interesting and inspiring. On Saturday, my first museum show opened at the Japanese Canadian National Museum. I did twelve paintings for the show and Robert Shiozaki constructed a sculptural meditation garden in the centre of the museum space. The idea I had for the show was that of Japantown Reimagined, an idea of the bustling stores of Powell Street if there had been no internment and the stores were updated for today.